Well, what a month we’ve had here at the Glaslyn Wildlife project! To say that it’s been a steep learning curve as the new project manager would be an understatement. I started work here at the beginning of March and I have to admit; it feels a little as if the busy Easter holidays set upon me like an Osprey on a floundering fish! We’ve been inundated with hundreds of enthusiastic visitors, all with one question on their minds; Has Mrs G returned? More on that later! So far I’ve spent most of my time at the visitor centre at Pont Croesor. It sits on the banks of Afon Glaslyn, surrounded by wildlife and views of Cnicht and Yr Moelwynion, it really is a spectacular place to work. With that said, the thing that makes it exceptional is the dedicated people who work here. Driven by their dedication to wildlife and passion for sharing their knowledge, this close-knit family of volunteers have achieved something very special indeed with a new visitor centre opening last year and a live streaming service now in place. For the first time ever, internet followers can share our excitement in real-time as the Ospreys return to the Glaslyn Valley. Watch live here. We’ve also received some great news this month that we will be the recipients of £12,000 thanks to the Tesco’s ‘Bags of Help’ initiative. We owe a huge thank you to Tesco and the people in our local community who voted for us in the stores at Porthmadog, Caernarfon and Bangor. It’s always been important to us that people leave our visitor centre feeling inspired, especially our younger generations. For that reason, we’re working on ideas to create fun learning experiences on our grounds at Pont Croesor. We’re going to build features and activities that will introduce children and young people to the wonders of the natural world and provide them with inspiration to continue exploring when they get home. Now, I did promise you some news of Ospreys! Well, I’m happy to report that at 17:47 on March 23rd, our protection site volunteers caught their first glimpse of the Glaslyn female (Mrs G) returning to her nest. The moment was caught on camera which was streaming live to the internet and you can almost sense the operator’s elation as he panned the camera up to see her, sat handsomely on her perch and unphased by her journey of thousands of miles. The last couple of weeks she’s been proving to us that she hasn’t lost her knack for landing big fish – how envious the local fishermen must be! Although I suspect that they enjoy the magnificent site of an Osprey diving into the waters as much as the rest of us. It’s not all been plain sailing for our Mrs G though! 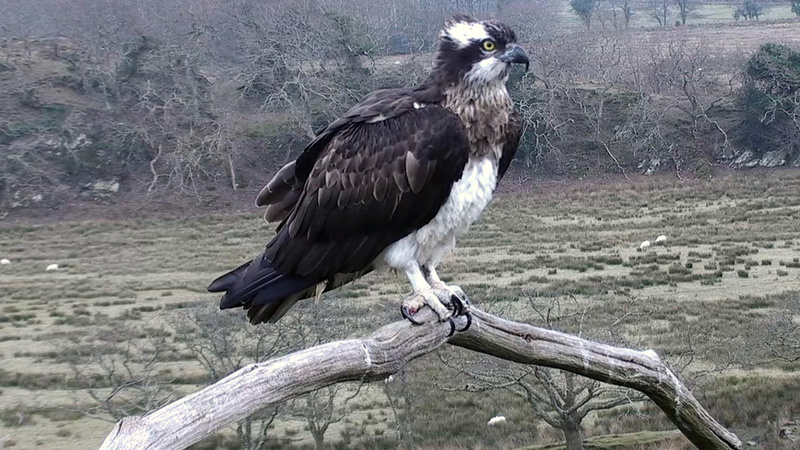 There have been a number of intruding Osprey seen in the area, including the mischievous ‘Blue 5F’ who seems a little braver this year and we managed to get some dramatic footage of her taking swipes at Mrs G on the 29th of March. It didn’t take long for Mrs G to see her off as the next day she flew a long way South to bother Blue 24 on the nest at Cors Dyfi! Spring is also an exciting time of year for watching other forms of wildlife and we’ve been blessed by the presence of Otters on a number of occasions over the past few weeks. Both at the protection site and the visitor centre where visitors were treated to a 2 hour fishing display. 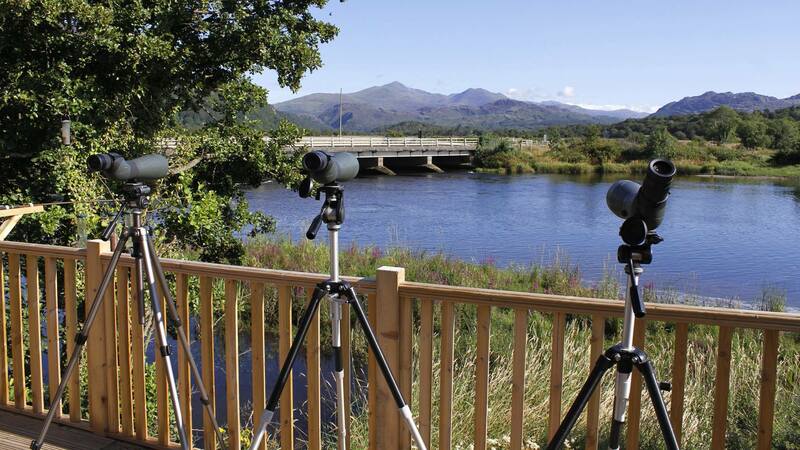 Visitors to the centre have also reported sightings of Kingfisher, Lapwing, Red Kite, Sparrowhawk, and the striking yet introduced Mandarin Duck so why not come over for a panad and see what there is to see on your back doorstep here at Pont Croesor!